The Krise Building, located at the west corner of Ninth and Main Streets, has been a landmark of downtown Lynchburg for over a century. While a great deal is known about the building’s tenants over the years (including Bowen Jewelry and First Colony), research conducted in conjunction with the current renovation of the building has uncovered some surprising information about its construction in the early twentieth century. W. Scott Smith is a senior planner at the Region 2000 Local Government Council and principal at HistoryTech, a local historic preservation consulting firm. He specializes in downtown revitalization, community development, architectural history and documentation, historic rehabilitation tax credits, and historic land tract mapping. Smith currently serves on Lynchburg’s Historic Preservation Commission and on the boards of directors of the Virginia Downtown Development Association, the Fifth Street Community Development Corporation, and the Virginia Chapter of the American Planning Association. 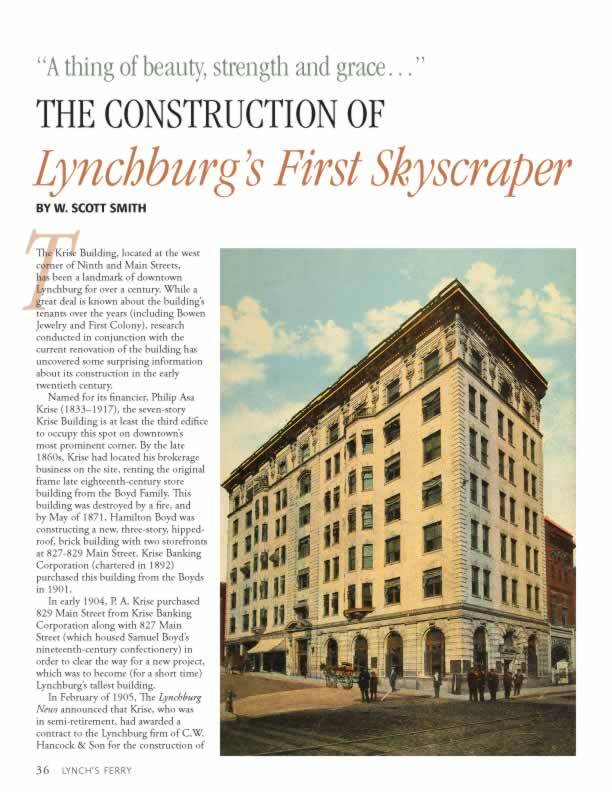 Scott studied history and marketing at Lynchburg College, and he and his family reside in a circa 1813 home in the Court House Hill National Historic District.